The Dibea can be used on surfaces of up to 100 m2. In the vacuum mode it is able to clean all hard floors like parquet, laminate or tiles as well as carpets. The robot hoover can adjust its suction power individually when meeting different floor environments. Thus, it does not only clean more efficiently but also saves up to 30 % energy. With only approx. 50 dB the robot works especially quietly. When battery is low, it automatically returns to the docking station to recharge. Two long side brushes and a bottom brush reliably transport dirt, dust and (pet) hair to a large 330 ml dust bin. Thanks to a HEPA filter, the vacuum and floor mopping robot is also suitable for allergy sufferers. Especially useful: The dust bin can be cleaned under running water, which makes the maintenance simple. 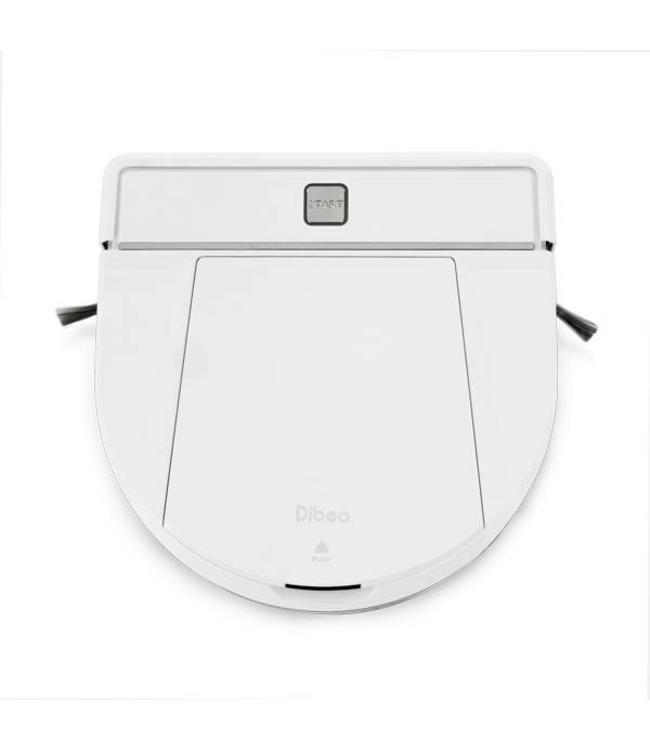 The innovative D-shape of the Dibea D850 allows the robotic vacuum cleaner to clean thoroughly along edges and in corners. With an overall height of only 7,5 cm, the robot vacuum also assures cleanliness under furniture. In just a few steps a water tank (80 ml) can be fixed on the Dibea. Thus, the device can vacuum hard floors and wipe them at the same time. The Dibea D850 is delivered with a remote control. With the remote control, the robot vacuum can be programmed and controlled. Additionally, a starting time for a daily automatic cleaning process can be set up. When in auto mode, the Dibea D 850 is able to automatically switch between four different cleaning modes – depending on the type of floor. This assures an especially thorough and efficient cleaning. In spot cleaning mode, the vacuum and floor mopping robot cleans a certain area with a spiral movement. This mode can be separately chosen on the remote control. The Dibea D850 is equipped with anti-collision and anti-falling sensors. Thus, it recognizes steps and sills and protects furniture.